Authentic Chinese Spring Rolls / Egg Rolls are a family favorite recipe passed down from generation to generation. 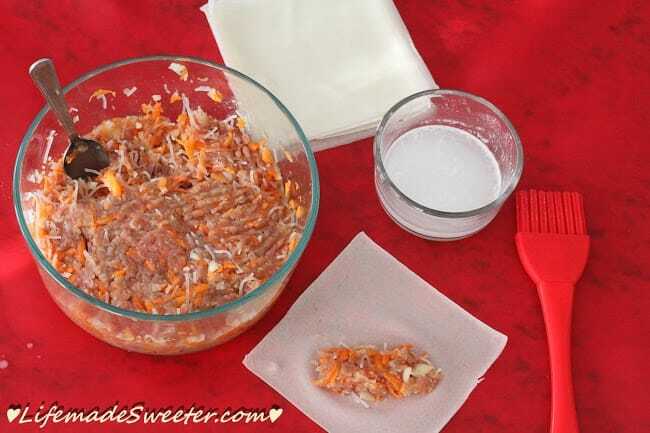 They are the perfect crispy appetizers with a ground pork filling, carrots and jicama. Best of all, there are instructions for oven baked, fried and air fryer versions. One of the dishes that I always look forward to having at our Chinese New Year family feast every year — are my mom’s crispy Spring Rolls / Egg Rolls. They are a favorite around here and I have so many memories of sitting at the kitchen table helping her wrap up at least a few dozen or so whenever we had a family gathering. So do you refer to these as Spring Rolls or Egg Rolls? I personally use both terms but some people refer to them specifically according to the filling and wrappers. Whatever you prefer to call these, they are equally tasty. They cook up perfectly golden, crispy, with a juicy flavor-packed filling. 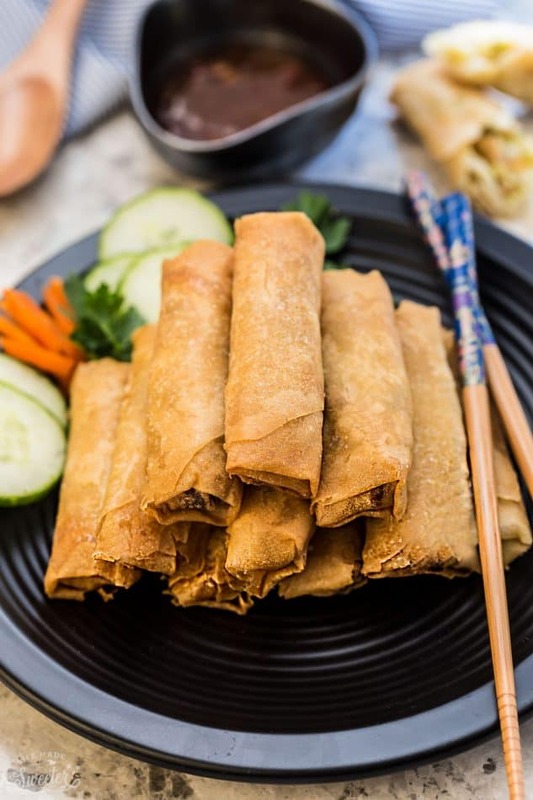 Spring rolls / Egg rolls are traditionally served at Chinese New Year since they represent wealth and prosperity due to their color and shape bearing similarities to a gold bar. These are filled with extra lean ground pork, grated carrots, jicama, onions and bean thread noodles. You can substitute the ground pork with chicken or turkey or even extra-firm tofu for a vegetarian version. 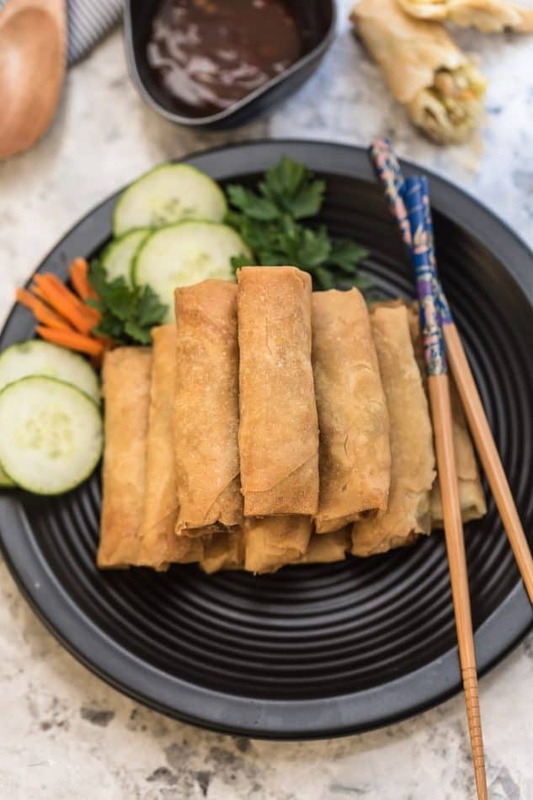 Since a lot of people are not big fans of frying (me included), I have also included instructions on how to bake these spring rolls in the oven. Feel free to cook them up whichever way you prefer and serve them up with your favorite garnishes and dipping sauce. 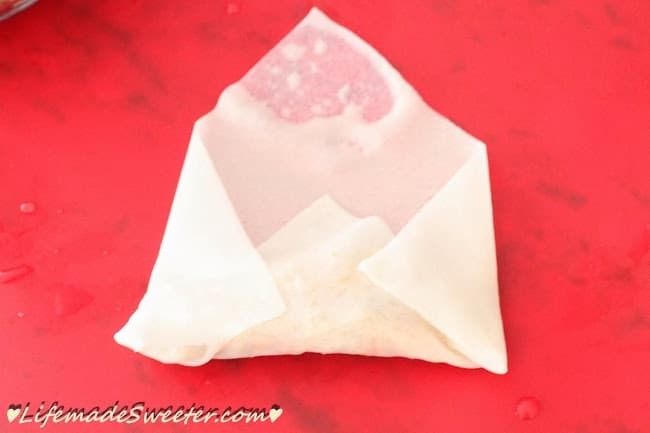 separate the spring roll wrappers into single sheets and wrap in a damp cloth and store in a zip-top bag the night before if desired. Delicious Authentic Chinese Spring Rolls / Egg Rolls are perfect crispy with a ground pork filling. Best of all, you can either bake, air fry or deep fry them. 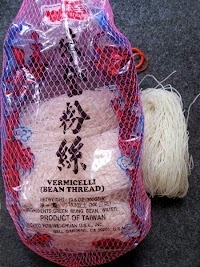 In a small bowl, soak the bean thread noodles in warm water for 20 minutes. Drain and cut into 1/2 inch pieces. 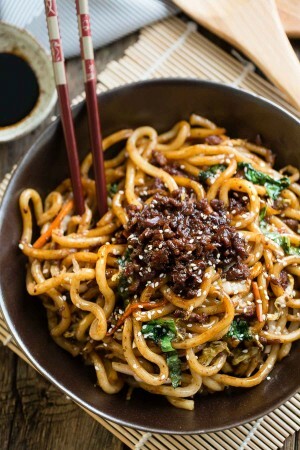 In a large bowl, combine all the ingredients for the ground pork filling along with the prepared noodles. Cover with plastic wrap and marinate in the fridge for at least 30 minutes. 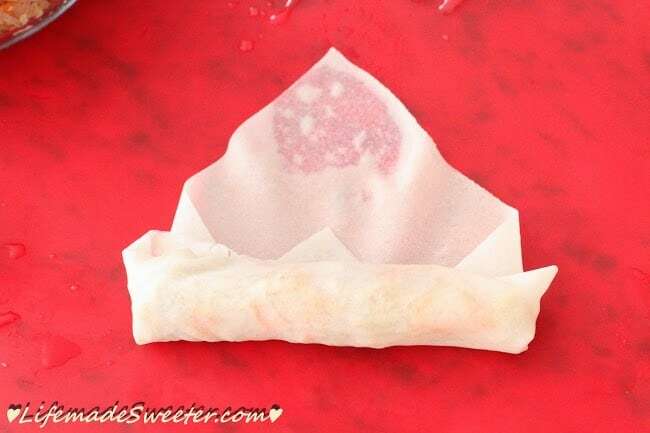 Separate the spring roll wrappers into single sheets as they are usually stuck together. In a small bowl, combine the corn starch and warm water together. Keep it close by where you will be wrapping the spring rolls. Lift the bottom corner up covering the filling. 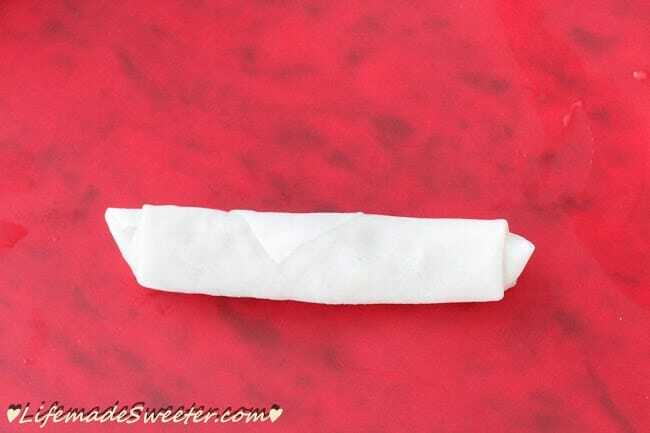 Then fold the left and right side towards the center. Continue folding up with a tight tuck-roll-tuck-roll motion. Finish up the roll, seal and place seam side down. Repeat until you have used up all your filling. Preheat oven to 425 degrees F. Line a large baking sheet with foil, then place a wire rack on top of it and grease it with cooking spray. 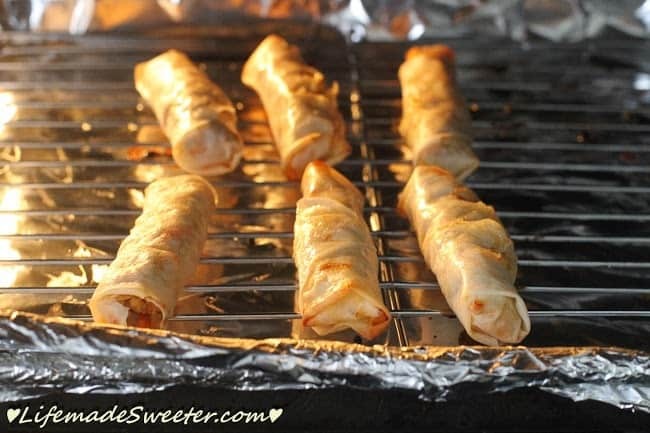 (If you don't have a wire rack, you can bake the spring rolls directly on the lightly sprayed foil). 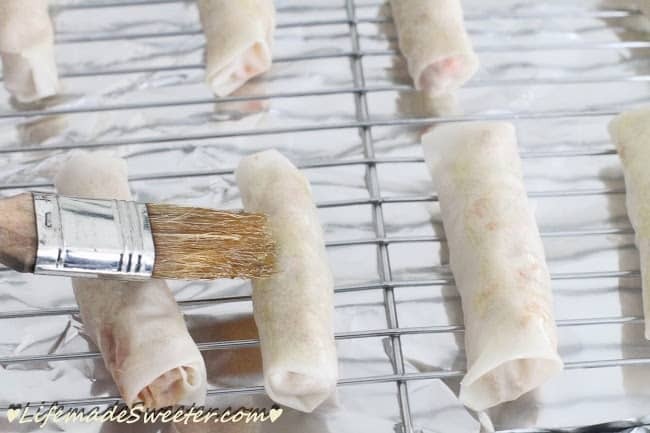 Place the spring rolls on the rack and brush with a light coating of olive oil. Bake in the oven for 10 minutes, then flip the rolls over and bake for an additional 10 minutes or until the rolls are a crispy golden brown. Fill a dutch oven, pot or wok with high heat cooking oil. I used rice bran oil. Preheat the oil to 350 degrees F (175°C). 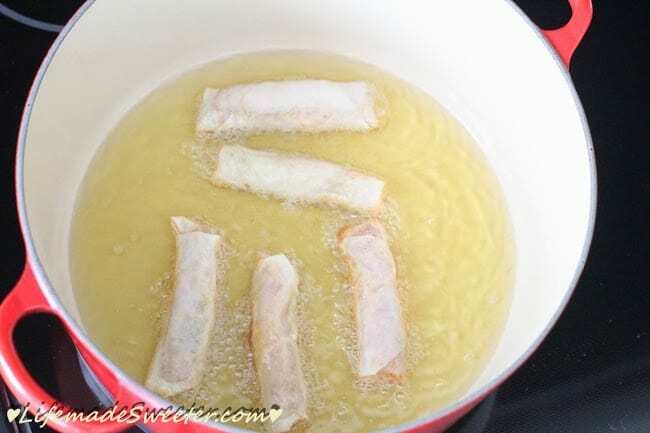 Gently slide in or lower the egg rolls, frying 4 to 6 at a time, rotating and turning carefully until golden brown about 11 minutes. Place cooked spring rolls on wire rack to drain and cool. Best served on the same day with your favorite dipping sauce. Brush the tops of the spring rolls with vegetable oil. 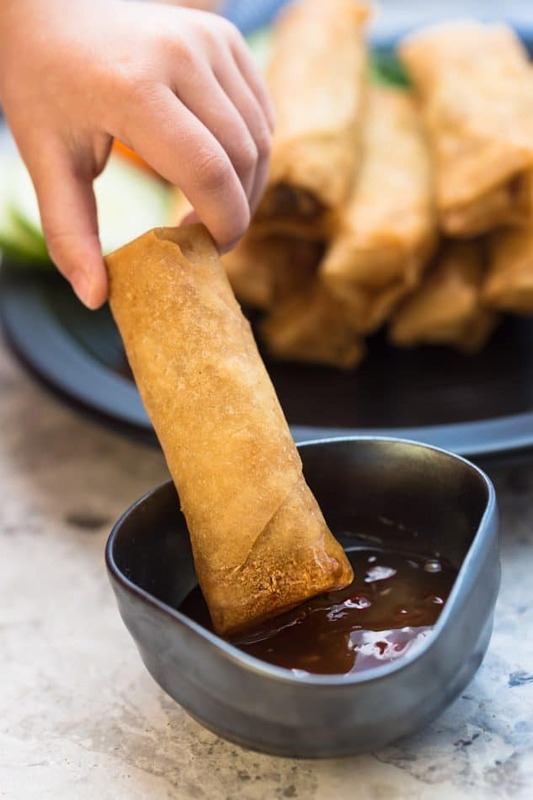 Arrange spring rolls in a single layer into the basket of the air fryer. You will have to cook in batches. Cook for 4 minutes then flip over. Cook for an additional 4-5 minutes or until crispy. Repeat until all are cooked. 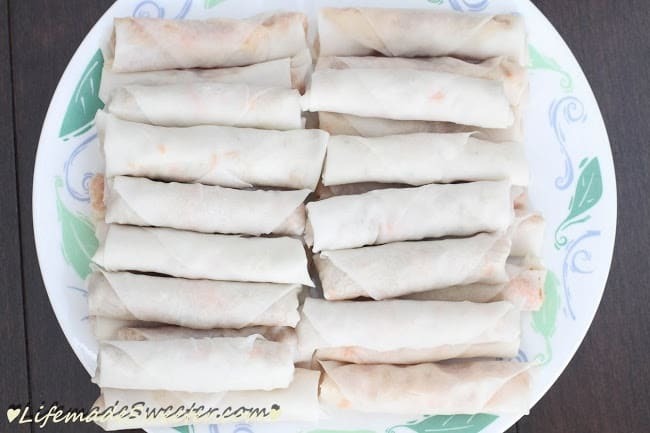 Wrapped spring rolls can be stored in the freezer and cook when needed from frozen. Just carefully slide frozen spring rolls in the oil and cook an additional minute or so. Ground turkey or chicken may be substituted for the pork. Add shredded cabbage if you'd like more vegetables. 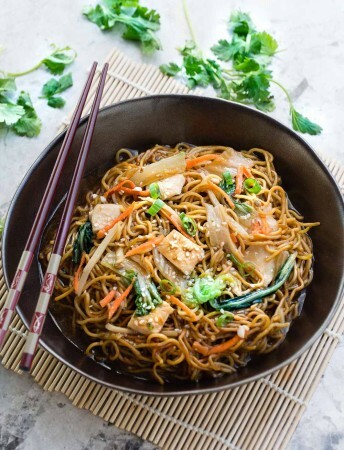 Vegetarians may substitute the meats with fresh tofu, just make sure to drain the excess water. -separate the spring roll wrappers into single sheets and wrap in a damp cloth and store in a zip-top bag the night before if desired. Wow, I never knew that bit about spring rolls representing wealth and prosperity because they’re shaped like a gold bar! That’s so interesting and I’m definitely going to think a little more the next time I eat one. Your version looks so delicious, I love that it’s your mom’s recipe and that they can be either baked or fried. I would definitely try these out with some tofu! We love spring rolls and yours look fabulous Kelly! Thanks for including a great tutorial – I am a little fearful of frying too and love that you included a baked version. Yum Kelly!!! I love spring rolls and am so glad for your helpful picture tutorial. These look so amazing, Kelly! I can never pass up a delicious spring roll, and I love that you’ve baked them and fried them. Girls need options! haha Have a wonderful day! We also love spring rolls! I haven’t made any baked versions yet but it sounds like I need to soon. I can’t believe Chinese New Year is this week! I love spring rolls so much, but have never even thought of making them myself. Love that you both baked them and fried them! These look delicious! 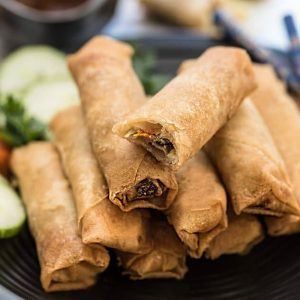 Are the spring roll wrappers you used made of rice or wheat flour? sorry me, even my mom now get used to baked springroll eversince my dad got diabetes, i guess i always love the sinsfully deep fried…. i always love the way you present the spring roll Kelly!!! Oh how I love spring rolls! I can’t wait to try this recipe! These look amazing! Better than any egg roll/spring roll I’d get at our corner place. Must try them! I never thought to make these from scratch. I agree that this is a great idea for a Super Bowl spread. Looks delicious! These egg rolls look great! Your mum must be such a great cook! These are probably great to have not only on CNY, but also at any time of the year! Oh man, I loveeee crispy crunchy spring rolls! They are the one thing I always order when we go out! I would probably go with the baked version since I don’t like to fry at home – something about that super hot oil that slightly terrifies me! Jicama?? really? That’s cool! I am definitely going to try this! I have a deep fryer, so I may fry them but I LOVE baking too, for a healthier option. Thanks for sharing! Looks like you have all the food groups in them 🙂 Lovely! You have totally called me out! Homemade spring rolls have been on my bucket list for quite a while, but I still haven’t taken the plunge. Out of fear of making our apartment smell like fry oil for a week, I’ll opt for the baked. Thanks for sharing this special family recipe! I was just telling a friend today I was craving spring rolls and then I saw this post.. it’s like me and rolls were meant to be together! These look amazing, you did such a good job! Oh, yum! These look so good, Kelly! My mother in law gave us a bunch of these threads the other day and it had me thinking of spring rolls but I was more thinking the cold kind since I’d never thought about making these. In my mind, they’re “spring” rolls, my favorite are the incredibly crispy Vietnamese ones. I love that you offered a way to bake them. As amazing as they are fried, I think I’d have to go the baked route because every time I fry, I regret it afterwards. Your mom’s recipe looks so delicious – love the dipping sauce alongside. Hope you have lots of very happy Chinese New Year celebrations…we’ll off to enjoy my mom’s authentic cooking this weekend! I love spring rolls, especially home made!!! Thanks for providing us with step by step pictures Kelly! Happy Chinese New Year when it comes! Perfect egg roll! I haven’t tried baked version and now I’m totally inspired to give it a try. I like deep frying and don’t mind it at all, but it’s good to know how difference it makes. Happy CNY, Kelly! That is sssooo interesting –> (Spring rolls / Egg rolls are traditionally served at Chinese New Year since they represent wealth and prosperity due to their color and shape bearing similarities to a gold bar.) I had no idea! A lesson with a recipe! 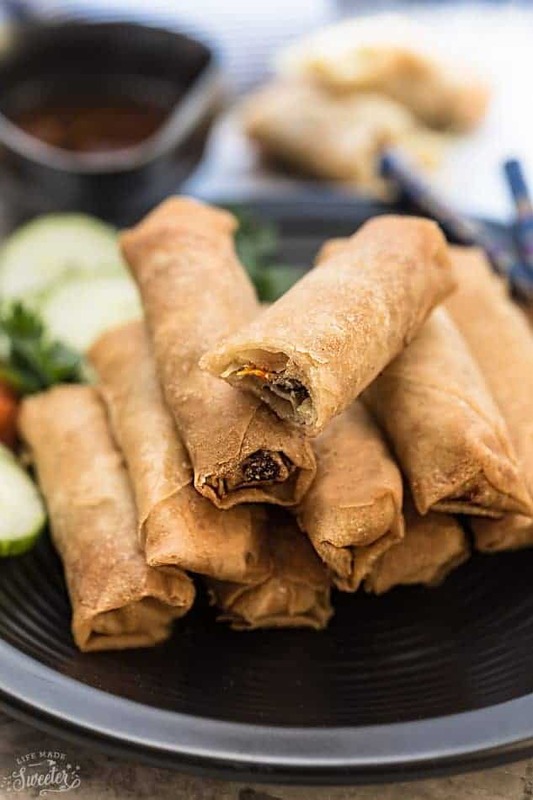 I absolutely adore spring rolls, and I love that you baked them – I’m with you – not a big fan of fried. So, I’m very glad for this recipe – I get the recipe I’ve been looking for and baked too! Excellent! Pinned! My kids are going to love even more when I make these for them! Especially my sister… she’s so excited about the Chinese New Year. Have fun today, Kelly! My kids love Spring rolls – the jicama sounds like a great idea. Happy New Year Kelly! I have never heard of using jicama in a spring roll nor did I know that they represent wealth and prosperity. I always prefer the taste of fired but baking is so much easier to do with less clean up. Both versions look delicious! I’m drooling for egg rolls at 9:45am….is that normal? These look a-maze-ing!! And how fun to use your mom’s recipe. 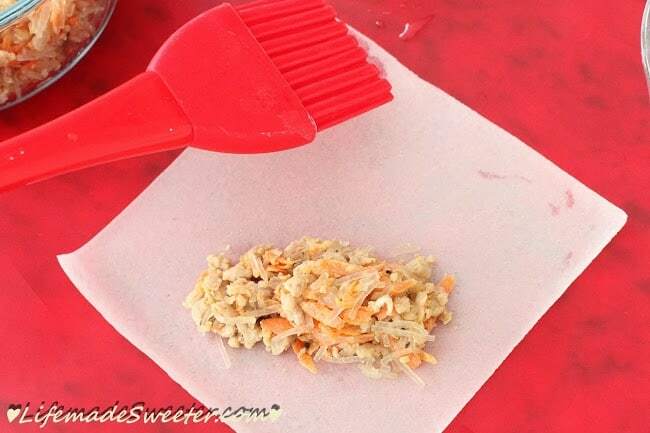 Thanks for sharing this special recipe… I love the instructions you included! Pinning! Wow! I didn’t know egg rolls were actually Chinese! I’m loving it…unfortunately I just finished my sausage meat yesterday, but as soon as I can get to a Carrefour, I’ll be back in baking business! Never occured to me to not fry egg rolls! spring rolls are number one appetizer in our household! This is a childhood favourite, Kelly. I love both fried and baked ones. Your serving plates are lovely. I’m not a big fan of fried foods; they make my stomach queasy. I will have to try your method of baking a spring roll. Again, your detailed tutorial makes it easy for me to make your delicious recipes! Thank you, Kelly. I love spring rolls and I think that your baked version is perfect! Oh wow, give me a dozen of these, please!! Egg rolls are a HUGE favorite in my family and I love that you’re sharing your mom’s authentic recipe, Kelly! These look so good with that dipping sauce! I usually call them egg rolls, but I’m not picky! 🙂 These look like such a delicious way to celebrate the New Year, Kelly! Wish I could dive right into that plate! 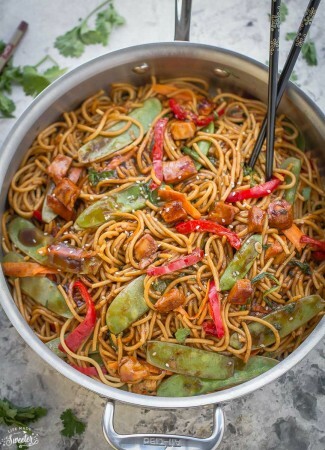 i will be turning 64 next month, and have always been afraid to try my hand at asian cooking. But now I am living in belize, where asian markets abound, and thought it foolish not to try. 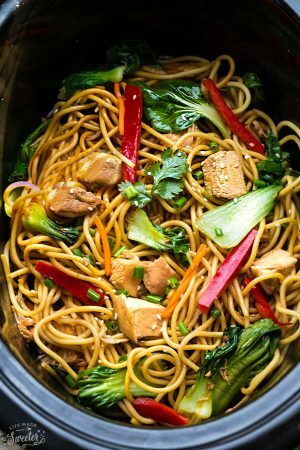 a few days ago I made your chicken chow mien and shared it with my neighbors – we all loved it! Today I tried, with great trepidation, spring rolls. those thin wrappers…really? But I can’t remember ever having so much fun in the kitchen! the thin wrappers are a hoot to work with! I will be trying more recipes, but especially, i will be making spring rolls again…and again…and again! so much fun!! !